The verify tool on the Transactions page allows you to separate your transactions into two statuses: verified, and unverified. Think of verified transactions as complete transactions and unverified as transactions that still need your attention. When you import or enter a transaction, it's good practice to ensure that there is a category selected, a sales tax set, any customer/vendor information is added, and the description is correct. None of these fields are mandatory in order to verify the transaction, but make sure you've included everything you need to keep your records accurate. The review tool on the Transactions page allows you to separate your transactions into two statuses: reviewed, and unreviewed. Think of reviewed transactions as complete transactions and unreviewed as transactions that still need your attention. Once you've checked that a transaction is correct, you can verify it. To verify a single transaction, you can select the checkmark to the right of the transaction, or select the left checkbox, then Verify. Once you've checked that a transaction is correct, you can review it. To review a transaction, click on the checkmark to its right. You can also mark a transaction as reviewed in the transaction details panel. Marking a transaction as reviewed doesn't impact your reports or the ability to perform bank reconciliation. Instead, think of un-reviewed transactions on your transactions page as a to-do list. Take some time to go through your unreviewed transactions and make any necessary changes before marking them as reviewed. Select multiple transactions using the checkmarks to their left, and click Verify. 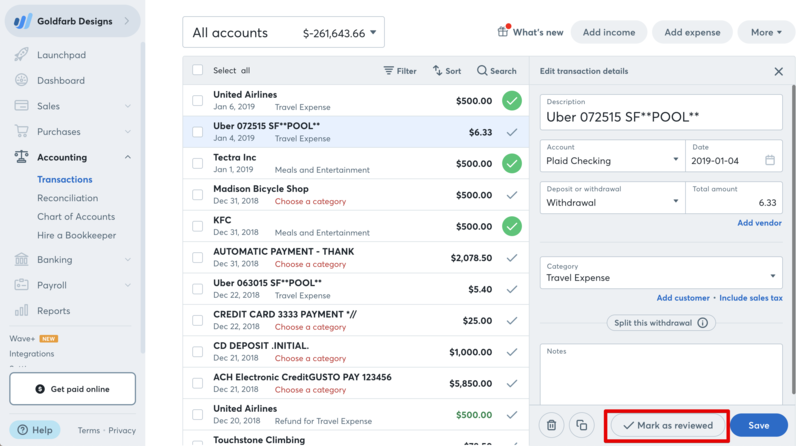 If you want to bulk verify all your transactions, start by selecting the checkbox at the top left. This will select all of the transactions on the page. Then, beside the amount selected, you will see the option to select all of your transactions. If you've selected all your transactions, you can click Verify. All transactions will be marked as verified. The transactions tab can be filtered by verified or unverified. Turn on the filter to only see unverified transactions – this is like giving yourself a to do list every time you log in. If you have filtered by Unverified, only transactions that need your attention will be displayed. You can also switch the filter setting to only view verified transactions. To un-verify a transaction, click the green check-mark to the right of the transaction. How do I record and track a check I wrote/received?